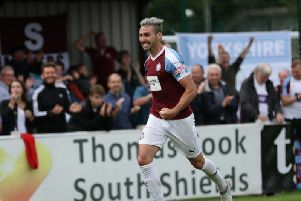 Josh Gillies celebrates his goal for South Shields. Pictures by Kev Wilson. 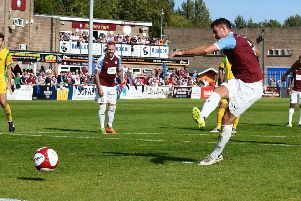 Lee Picton and Graham Fenton chalked up their 100th win in charge of South Shields as the Evo-Stik Premier Division leaders swept to a 3-0 victory at Matlock Town on Saturday. The Mariners’ fifth consecutive win was a milestone one for the managerial duo in their 123rd game as joint managers of the club. Two goals in three first half minutes from Gavin Cogdon and Josh Gillies put Shields on their way before David Foley wrapped things up after half-time with his first goal since rejoining from Spennymoor Town. Picton and Fenton unleashed front four Cogdon, Gillies, Foley and Carl Finnigan from the start together for the first time at Causeway Lane, and the early signs were positive. Robert Briggs picked out Foley on the left flank within the first five minutes and he skipped past his man before advancing into the area and forcing goalkeeper Richard Walton to push the ball to safety. Although Shields were not at their fluent best in the early exchanges, they did have the best opportunities. They almost took the lead in spectacular fashion on 14 minutes when a Gillies free-kick hit the wall but bounced the way of Briggs, and his fierce left-foot volley from 25 yards just cleared the crossbar. That was to be among his last actions after a late challenge by home captain Cleveland Taylor left him nursing a leg injury which forced him off. Ursene Mouanda replaced Briggs, and he was to have a superb impact on the game. The hosts almost took the lead on the half-hour mark, though, when the ball bounced the way of Thomas Davie on the edge of the box and his powerful drive went just past the post. The vital first goal eventually fell the way of Shields in the 38th minute. Mouanda was at the heart of it, exchanging passes with Finnigan near the halfway line before he motored forward and played in Foley on the inside-right of the box. Foley’s low strike was too hot to handle for Walton and he spilled it to the feet of Cogdon, who made no mistake from close range. Less than three minutes later, the Mariners extended their advantage when captain Jon Shaw chipped a tremendous ball forward which Gillies controlled with his chest before calmly waiting for his opportunity to pick out the bottom corner. The scoring was completed 11 minutes into the second half when Gillies beat his man on the left before his terrific low cross was flicked by Finnigan and parried by Walton to Foley, who smashed it home. Shields were in complete control and could have made the scoreline more one-sided in the closing stages. Dillon Morse went close to making it four when he was played in on the right and his powerful shot across goal was tipped wide by Walton. The Mariners were left scratching their heads as to how they did not add another goal after a Gillies cross was met first by Finnigan and then Morse, but both efforts were cleared off the line. Matlock prevented Shields from scoring again but could not stop their current march. They will hope to continue their impressive form into another competition tomorrow when they take on Morpeth Town at Mariners Park in the League Cup. Meanwhile, Shields’ academy side are at home to Spennymoor Town tonight in the FA Youth Cup. The club is hoping for a good turnout at the 7pm kick-off at Mariners Park, with admission costing £2 for adults and £1 for concessions. SOUTH SHIELDS: Connell, Hunter (Brown 79), Adams, Shaw (c), Morse, Turnbull, Gillies, Briggs (Mouanda 23), Cogdon (Wright 63), Finnigan, Foley. Subs not used: Pearson, Lough. Goals: Cogdon (38), Gillies (41), Foley (56).